It all started at a party with a bottle of protein powder. Erin Parker, a Stanford graduate and enthusiastic proponent of “bikini bodybuilding,” was visiting a friend’s party while holding some protein powder. These amino acids proved relatively unpopular with the other guests in attendance, but one other person at the event was at least curious about the woman holding protein. Nidhi Kulkarni, an MIT computer science graduate and competitive rower, walked up to Parker and began asking questions about the powder, such as how to use it to more effectively put on high-quality weight. The two nurtured a friendship, and several months later, joined together to build a new workout app for women called Spitfire. Parker and Kulkarni are on a mission to provide women with a very different type of workout app, culled from their own experiences as strength builders and athletes. Instead of showing a couple of ineffective exercises, Spitfire presents comprehensive “plans” that teach women how to reach their long-term goals, even when they will require immense work. Each plan is inspired by an actual woman, and none of the images in the app use models (in fact, many are of the founders themselves). Their hope is to encourage women to believe that they can achieve incredibly difficult challenges with more realistic depictions of the steps ahead, building “spitfires” in the process. Like the goals at the heart of the app, though, these two co-founders also had a long road themselves to see their vision reach the app store. Parker was once determined to become an investment banker, but over the course of the past two years, has picked up Ruby on Rails and iOS development all the while continuing an intense workout regimen. Kulkarni, one of the top graduates from MIT’s computer science department, also walked onto the university’s crew team, competing at the Division I level for several years. Through Spitfire, they hope to imbue their own grit into an app usable by women everywhere. Spitfire’s primary mission is simple: set a goal and choose the right plan to get there. When users first log in to the app, they are asked a series of questions on what they want to do. First, users are asked to set a goal. Today, there are two options, strength and physique, but the founders hope to add others like endurance, power, flexibility, and agility in later updates. Next, they have to select whether they want to focus around gym equipment or body-only exercises. Once these simple questions are answered, the app will recommend one of five plans that best match. These plans are the core of the product. Within each plan, there are tasks to complete each day for several weeks, and clicking through the days offers exercise tips as well as photos to guide exercise novices through any complicated maneuvers. As you complete tasks, a progress bar fills up, and you can fill in notes for each task such as the weight of your barbells or the number of repetitions. Each plan was inspired by an actual person, and you can read their biographies. The hope is to show users that there is nothing “elite” about the kind of high-intensity strength training promoted by Parker and Kulkarni, but rather that such exercises are accessible to anyone. “We want to demystify the process,” says Parker. For instance, one plan for strength training was inspired by a nationally recognized weight-lifter named Emily, while another plan was inspired by a software developer named Pamela who lost 50 pounds through her own approach to exercising. The founders currently develop their own content, but over time, they hope that about half the plans in the app will come from users themselves, inspired to share their own approaches to a variety of goals. For Parker, the journey to startup founder was quite circuitous. Coming to Stanford in 2007, she was focused on getting a position in her dream job as an investment banker. She got a coveted internship offer her sophomore year at JP Morgan, only to find the environment deeply stifling. While Parker had mentors in college who were involved in startups, the pivotal moment came during a weekend known as Rails Bridge, which had reached out by email to encourage women to learn how to code. There, Parker learned how to build a basic app using the popular Ruby ecosystem, and found that she had a natural aptitude for coding. She took the next year to focus on programming while holding various side jobs to pay the bills, all the while continuing an intense fitness regimen. When one of her fitness demo apps started to get traction through TestFlight, she knew that she had found something special, but would need a co-founder to move it forward. She found that person in Kulkarni. Kulkarni has nurtured a long-time passion for computer science. She was first exposed to the field in high school, and continued her studies at MIT. In addition to the punishing workload of Course 6, Kulkarni walked onto the women’s crew team, where she regularly woke up at dawn to practice. That regimented schedule didn’t prevent her from reaching the pinnacle of student performance at the school and graduating into an engineering job at Okta, the enterprise identity management system startup. She was quite pleased with her job in the initial months, and even got promoted as the company accelerated its customer integrations. Yet over time, she wanted to try something new and began looking for other options. When she saw the designs for Spitfire, she was hooked, and she and Parker officially started working together last November. Of course, it is still early stages for Spitfire. 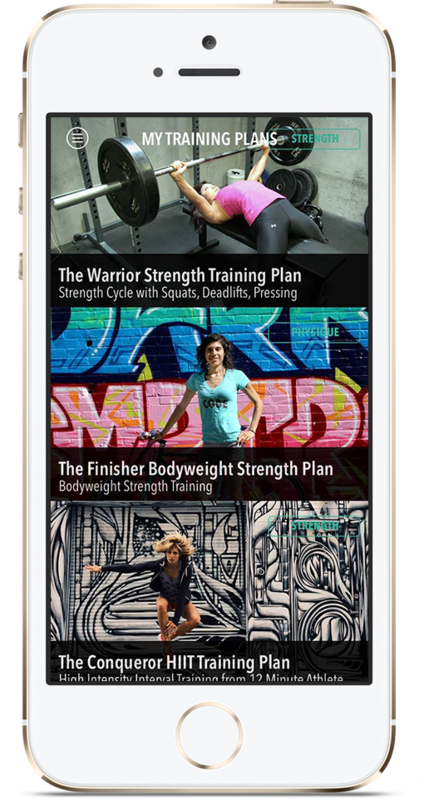 The founders hope to add several features in the next few months, including the ability for users to develop their own completely customizable plans, and to provide more social features for strength-training females to find one another. The company is also completely bootstrapped while they continue to experiment with the product and its business model. Like the plans in Spitfire, these two co-founders have a large ambition for how women should build their exercise routines. Just don’t expect any little pink barbells to make an appearance.